Classical guitar playing is often considered more difficult to play than other types of music. A lot of beginning guitar players shy away from it for fear they aren’t capable of learning classical guitar or that they don’t have the discipline. Lots of rock players may be afraid it isn’t cool to play classical, when, in fact, there are a lot of great rock guitarists who incorporate classical techniques into their rock playing (think Yngwie Malmsteen and his blistering Strat runs). Many speed metal band guitarists build their solos around classical motifs. Just listening to some of this stuff can be daunting for the beginning guitarist, but with lots of practice, you can learn the techniques and theory necessary to appreciate classical guitar in its pure form or as an extension of whatever genre you prefer playing. Classical guitar lessons for beginners start with scales. Major and minor scales are important, but a lot of classical music is chromatic, meaning there are sometimes notes added outside of the key a piece is written in. It helps to study transcriptions of classical pieces to get a feel for how these accidentals are used throughout a piece. 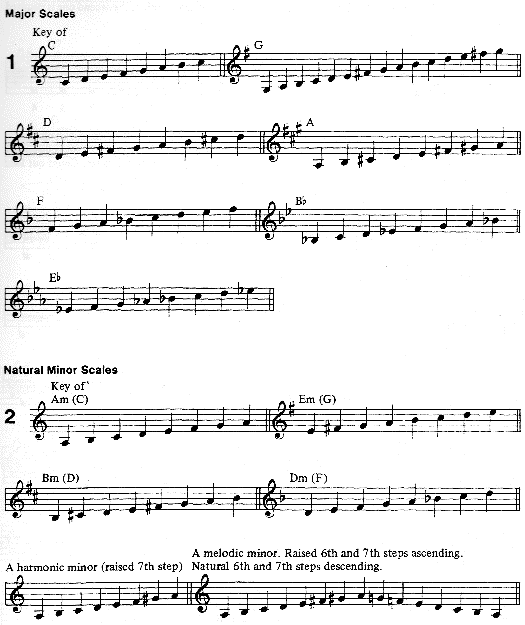 In the first example below you can see some of the common scales used in classical playing. These are the same scales you’re familiar with. 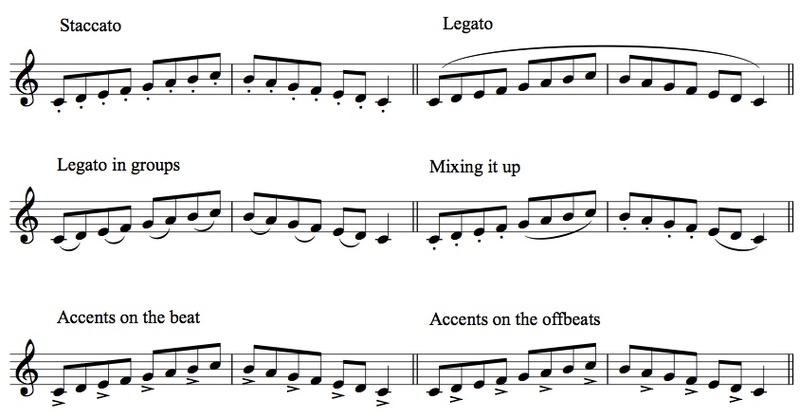 The next example shows some of the articulation markings you’ll frequently find in classical playing. Classical guitar lessons for beginners often focus on articulation because it is such an important element in classical playing. Fingerpicking is also one of the styles often found in classical guitar. The best way for beginners to master classical fingerpicking is to play some simple classical fingerpicking arrangements. The examples below, Mozart’s “Night Music” and Beethoven’s “Ode to Joy” are very simplified fingerpicking arrangements suitable for use as classical guitar lessons for beginners. The more advanced you become, the more complex arrangements you can play, but these are easy enough to help you grasp the basics. While classical music may seem daunting, don’t let it scare you away. There are lots of websites that offer classical guitar tabs that beginning guitarists can play. There are also websites offering classical guitar scale exercises and video sites that present classical guitar lessons free of charge. Start slow and take in all of the available lessons. You’ll be surprised how easy it is to begin to learn to play classical guitar. Thank you for your informed writings. I have just bought a classical Guitar. And your classical DVD’s collection. Any tips for Left Handed people please ?